Here are ten inspirational quotes for women living in a time that offers exciting possibilities, yet places tremendous demands on them in the home and the workplace. 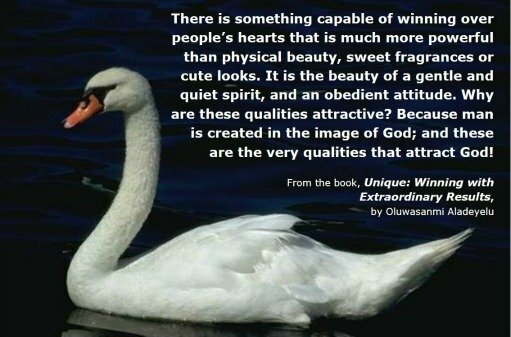 The quotes were all taken from the book, Unique: Winning with Extraordinary Results (author: Oluwasanmi Aladeyelu; editor: Ursula Lang). "We must understand who we are and who we are not, in a world that dictates what’s 'in vogue' and — if we are not careful — turns us into 'look-alikes'." "Before you start talking about discovering your purpose in life, you must discover yourself because, if you do not know who you are, it will be hard to find out the proper way of going about your life. If we don’t know who we are, how can we know what to do with ourselves?" "Beauty and ugliness are not just skin deep. They are heart deep." "There is no real man who will not appreciate a pretty lady with nicely fixed hair, lovely makeup and elegant clothes on her; but you can tell that all this external beauty only moves men just for a while." "But if all the beauty a woman has is on the outside and there’s nothing much inside her, she will definitely become a very miserable person when her external facade fades — as it must with time — and no sensible man will love to hang out too long with her. The truth is anyone with a lousy spirit and an offensive attitude is most ugly." "There is, however, something that is capable of winning over people’s hearts that is much more powerful than physical beauty, sweet fragrances or cute looks. It is the beauty of a gentle and quiet spirit, and an obedient attitude. Why are these qualities attractive? Because man is created in the image of God; and these are the very qualities that attract God!" "We may not possess the answers to all the questions there are, but that does not mean we don’t have something to offer." 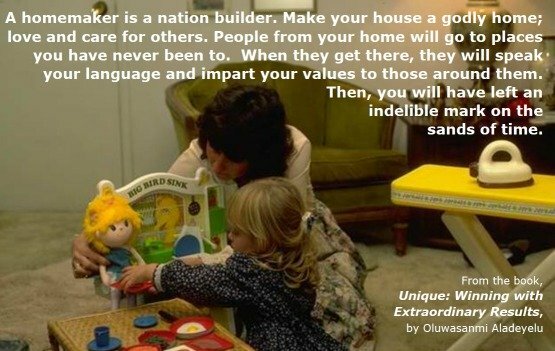 "A homemaker is a nation builder. Make your house a godly home; love and care for others. People from your home and people you have touched will go to places you have never been to. When they get there, they will speak your language and impart your values to those around them. Then, you will have left an indelible mark on the sands of time." "When the delegated task intimidates subordinates, a leader must be willing to help out. Asking for a leader’s help will not be demeaning as long as the leader leads by example. Great leaders don’t mind helping out. Do you?" "First, before you can lead successfully, you must have proven yourself to be trustworthy and competent; second, before anybody will follow you, you must first be a blessing to them; and, third, you must be ready to offer them something in exchange for the value they will be adding to your cause."